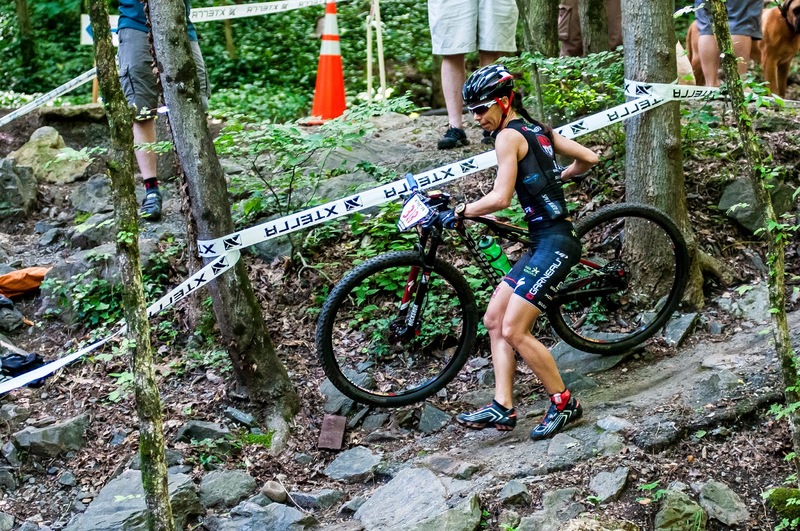 Xterra Article - Beata Wronska - Just call me "B"
Equipment used: Specialized S-Works Epic WC from Bike Tech Miami , Louis Garneau custom Tri Kit, LG Course Helmet, LG T-Flex 2LS Shoes, LG TR-40 Bag, Magura MT8 Brakes, Syntace Duraflite Carbon handlebars, Syntace FlatForce Stem, Syntace P6 HiFlex Seatpost, Xpedo M-Force 8 Ti, NoTubes Race Gold's, Schwalbe Rocket Ron's and Racing Ralph's, Huub Speedsuit, ESI Grips, Rotor crank, Rotor QX1 32t Chainring, KMC 11SL Chain, Salomon Sense 3 Ultra Soft Ground, Suunto Ambit 2 S, Light and Motion Solite, Kuat NV Bike Rack, Clif Shot Gels, Oakley Radar Sunglasses with VR28 lenses and Garden of Life nutrition Every Day of my Life... And I used new gadget a Pocketfinder that kept track of me so my Husband always knows at all times during the race where I am. 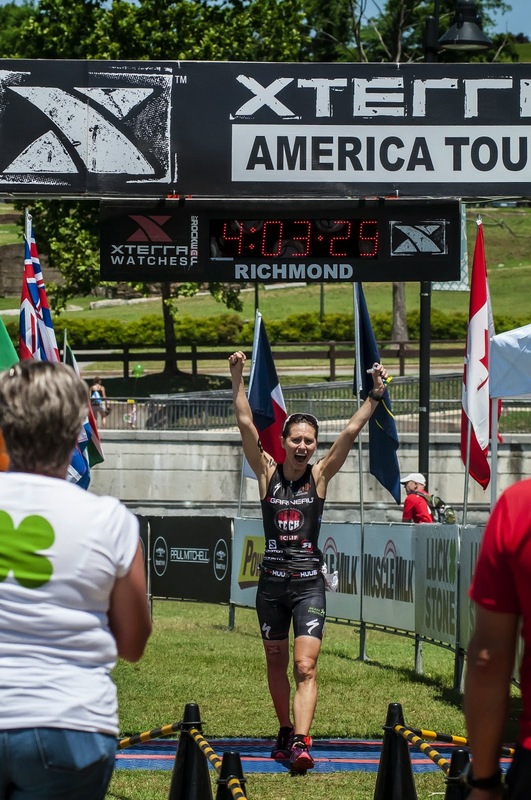 Another year went by and I was eager to come back to my favorite race and amazing venue of Xterra Richmond. It’s easy to think that since you have been here once or twice it will be all the same and you had it figured out. It is never the case however since so many things change each time we are here. From the weather pattern, to the race format, to the people you are racing against. And the race course is so insane, difficult, challenging, intimidating, unpredictable and exhausting like nothing else that I ever raced. Two years back the race was just perfect, calm, clear river, dry fast trails and an awesome run. This is when I fell in love with this place and knew it will stay on my race calendar. A year ago the tropical storm turned the swim course into a raging river and the bike course to a slimy mess that put me ultimately in the hospital with fours staples in my head. It was the only race ever for me that I did not finish because of this terrible crash. This gave me a whole year to think about and plan my return. And here I am driving up to this crazy city with a head full of images of us blazing down those amazing trails. I seriously miss them and just want to ride my bike here and have an awesome time. But besides the whole 884 miles being bone dry, it had to start raining badly on the last 16 miles of our trip and this awful grey sky covered the whole landscape. The joy ride was not about to happen unfortunately. We went to the hotel and planned to get on the course sometime in between the showers the following day. 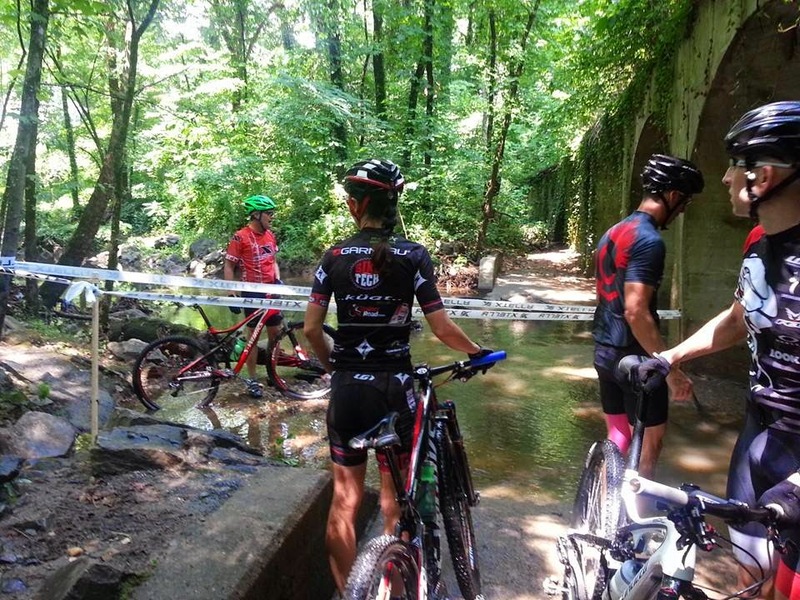 Pre-ride with flooded tunnels; Part of the race course! The purple grips on my bike were to match the electric atmosphere of the City of Richmond! The trails were still wet after it rained here already for over two days and not everything was completely rideable or safe. We tried the following day to get out and see some more. Now the trails were drier but still not perfect. I got bruised up from this practice and kind of regretted a little getting out there on the trails. My practice swim, the only one that I got was nice but also brutal in a way. The water level was twice as high as just a few days back and the current was extremely strong and visibility was close to none. The runoff water turned the river all dark and brown with debris and broken trees scattered all over. I got caught under the bridge in a strong current and was swimming up the river for some 10 minutes and was not getting anywhere, it was exhausting. I wondered about the race and how this was going to end up especially for those who were not strong swimmers. I didn't feel great the day before the race. I was nursing now a lot of small aches in my legs and was feeling tired from a whole week at work cramped in 3.5 days and an additional 13 hour travel to get here. I tried my best to stay optimistic however and with hope that on the race day my inner power will come above it all. The race morning was beautiful, with warm temperatures, blue sky and was full of energy. My Pax was so excited however that when we started heading out for the race site in the morning he totally drove in the opposite direction. This added some stress of the day that he was going to go through. I’m not going to say that I was not stressed since this is part of the game to be stressed enough to be alert and motivated but still calm enough to make rational decisions. I kept my cool and after a U turn and zigzagging through a city maze we finally reached the site. I rushed for the body marking and to set myself up in the transition area. I was happy with my spot and noticed that my friend and main competitor today Brook was setup at a rack just in front of mine. 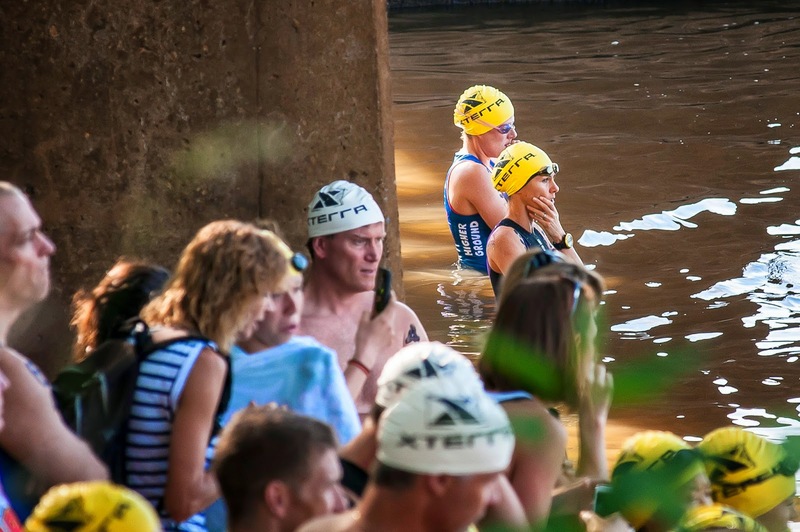 We heard the announcement of the Pro start and rushed to the river bank to watch the Pro swim. All I can say is I wish we took a recording of what happened there. It was insane to watch and even more mind boggling to know we will be next soon. The moment the swimmers hit the first strong current everyone got swept to the side, than swam against the current and started dolphin hoping, running, swimming and log hoping along a submerged sand bar. Than when heading for the third buoy the second set of super strong currents swept everyone down the river and something that should look like a straight line looked now like a boomerang. It was a fight to make the buoy. Than the island run and back to the water for the longest and scariest part of the river. This is where hell opened up and almost everyone got swept by the river and had an extremely difficult time making the 5th buoy. If it was missed just by a few feet it was close to impossible to make it back up against the current and around the buoy. After a while of battling the current a big number of the Pro racers gave up and swam to the next buoy. However some of the racers were enforced to keep on trying and were kept swimming in this nightmarish infinity pool like a scenario for a long time without getting anywhere. This was dramatic to watch from the shore and even the last buoy didn’t look so easy to get around for them and there was a lot of chaos around this spot. This was definitely something amazing to be seen. I had to rush now however for a quick warm up and get on with my race since I was starting just shortly after. When I got to the water edge this is when Brook and I finally had a chance to talk. For her being such a terrific swimmer I found out that she didn't even attempt to preview the swim course, it was so intimidating. I knew however that she would do well and we both tried to stay positive. I positioned myself in the murky and fast moving water full of tree branches. The river was quite deep after few steps in and there was no way I could stay in the same spot and wait for the race start. Thankfully some ladies discovered a partially submerged tree branch that many of us stood on and were holding on for the dear life. Swim, run, swim, run, swim? The super loud cannon went off. I jumped off the branch and I was off sprinting to the middle of the river to the first buoy. I looked around and I liked what I saw, seemed I was in a good lead at least with the ladies that were next to me. But after reaching the first buoy and heading now against the current this is where fatigue started to get to me pretty quickly. This buoy was pretty congested and everyone was stacked up on each other in a very narrow section between a small island to the right and strong current to the left. I had two ladies under my both arms and a strong current rushing against my body and I had no means to keep moving forward in that fashion. It was a hard battle and getting out of this bottle neck was lengthy and close to impossible. I was gasping now and was extremely tired and was dreaming of getting on this sand bar as soon as I could. Which side of the buoy? When I finally got there I didn't care the water was still deep, it just felt so good to have feet on the ground. After some walking, hoping, jogging I was off for the next buoy. Thankfully I aimed just perfectly and didn't get swiped away but the strong current. But when I looked to the left of me most of the swimmers were already down the river. Next buoy and island run and I had to jump in for the most intimidating part of the river. The current here was so strong that I could only hope to stay up and not to get swept away to the tree and down the river. Somehow I was moving through this section very well and kept calm and managed to get to the buoy as close as some 15 feet away. After that I knew it should be easier but really it was not and I remember grabbing some rocks and trying to hold on to them while being swept off my feet. Two final tough buoys and I was aiming now for the boat ramp. 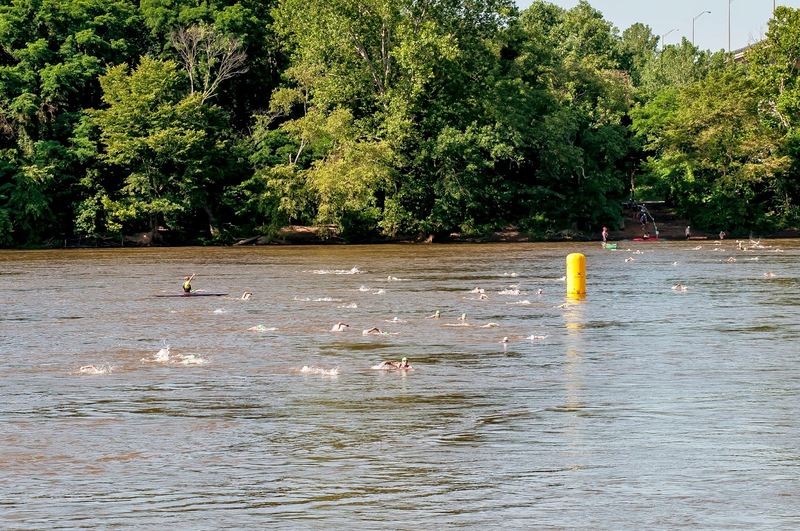 I had to sprint out not to miss it and let the river carry me away from the swim finish. All this adventure was so energy consuming and a very long run to the transition definitely didn’t help things in any way. When I grabbed my bike I could definitely feel the pain. For many different reasons the first lap of the bike course felt very exhausting and stressful in a way for me. Those trails were so technical and challenging that I had to pay attention to all the roots, rocks, drops like a hawk. I rode as smooth as possible and was hoping to make some necessary ground. I was 4.5 minutes back after Brook and 6 to Misty, both amazing swimmers. Everything went pretty smooth until we got to the flooded tunnels and hike a bike climb out of it and into the Forest Hills Trail system. On the way out of the trail however and final rocky descend (Craig Evans' Creek) to the tunnel there was a rider down on the bottom of it and was being pulled as I was approaching. Unfortunately I was called not to ride this section and had to run it down. After that I was about to get on the most demanding miles of the course where all the amazing crazy spectators are, wet rock gardens and challenging wall climbs and rocky descents. 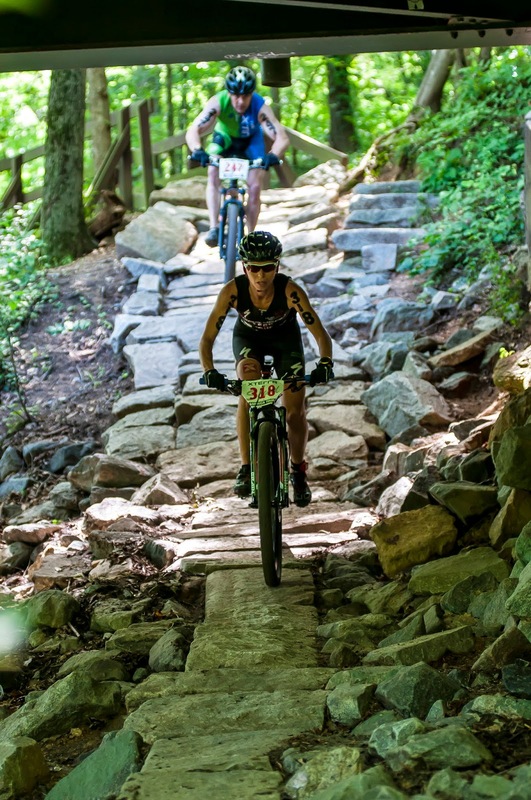 The problem now was that the Sprint racers who skipped the Forest Hills were partially scattered on the trail ahead. 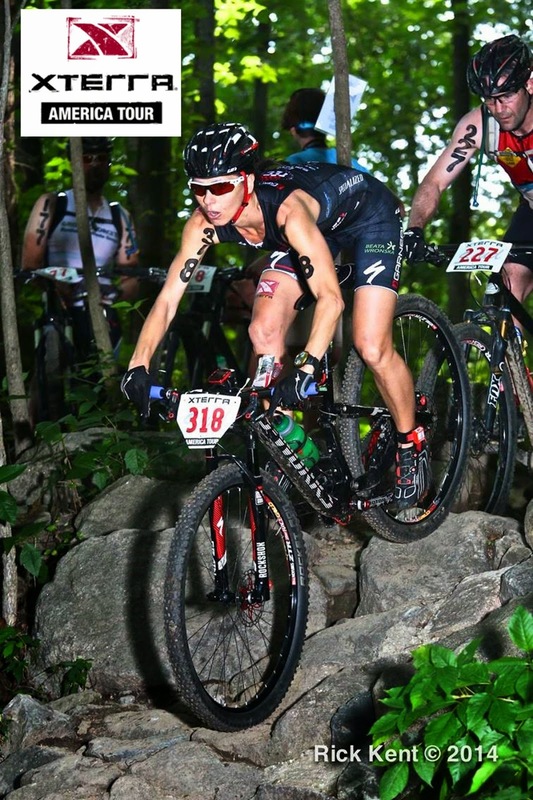 That added sadly another element to this race that was really much uncalled for and besides being slowed down on the very demanding sections, often I had to get off my bike and just almost pedal with hardly moving forward since a line of slower riders was occupying the trails. When I approached the rock climb I had a slower rider in front and was forced to dismount after covering only the first section. It was frustrating at least and I did everything I possibly could to get around all this traffic. I was happy however to ride fully the longest and most difficult and wet rock garden where tens of spectators were yelling and cheering me on when I was clearing rock after rock and ultimately succeeded. It was fun and all the encouragement gave me strength to keep fighting those elements. At some point I had an older gentlemen standing right in the middle of my path with his bike and when asked if he was fine he said yes and that he just lost his shoe. Yes, his brown leather shoe was laying a few feet below right on my path. Good times. I can't even describe in one post all the chaos and everything that happened on this course that day and how many times I had to halt my progress to go around riders. I knew I was not racing to my potential but I did the best I could under the circumstances. For the better news I was making progress on Brook who was still in front and on the mile 9 from what I remember I was able to get on her tail and make a pass. 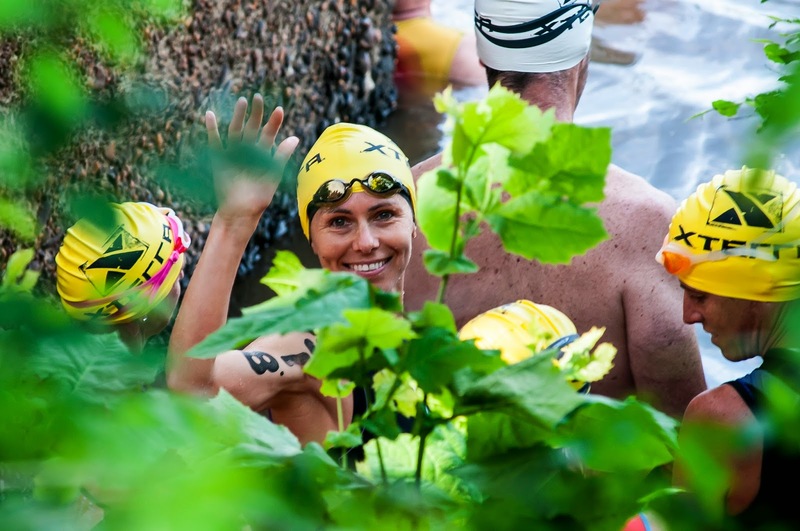 And even though I got away what seemed for a while and got onto the bridge with the cheers of the XTERRA crew and Race Director Dave Nicolas, Brook was still close by. On the second lap of the bike course for the first almost two miles we were still together. She is a very good rider and has a kind heart and even gave me a complement while following my tracks. After time I was on my own however working the terrain and enjoying this tough ride. I can't describe how many good time besides all the difficult moments I had. On the second lap right before the end of the forest hills I caught up to brightly and flowery dressed Misty and was able to make a pass. This is where a fast and fun descent was and I enjoyed greatly flying over the rocks and then going over a narrow concrete flood wall with steep drop offs on both sides and another wall that I was just heading now full speed on to. This required quick brakes and right or left turn and dipping once again to the tunnel. I felt more relaxed and more focused on the second lap and managed to make fewer mistakes than the first time around. I have this whole movie of the course and my race playing in my mind and I just wish I could share it so everyone can see what we all had to go through. I rode with no issues the final miles and last long rocky descent and sprinted to the transition. Luckily for me I made up a big chunk of time on both girls on the bike part of the race, 7 minutes on Brook and 9 minutes on Misty. It was great to see Pro’s standing around and actually cheering me on while I was getting my run gear on and was heading out of T2. I recognized Craig Evans voice in this group. This is where the soul searching begun. 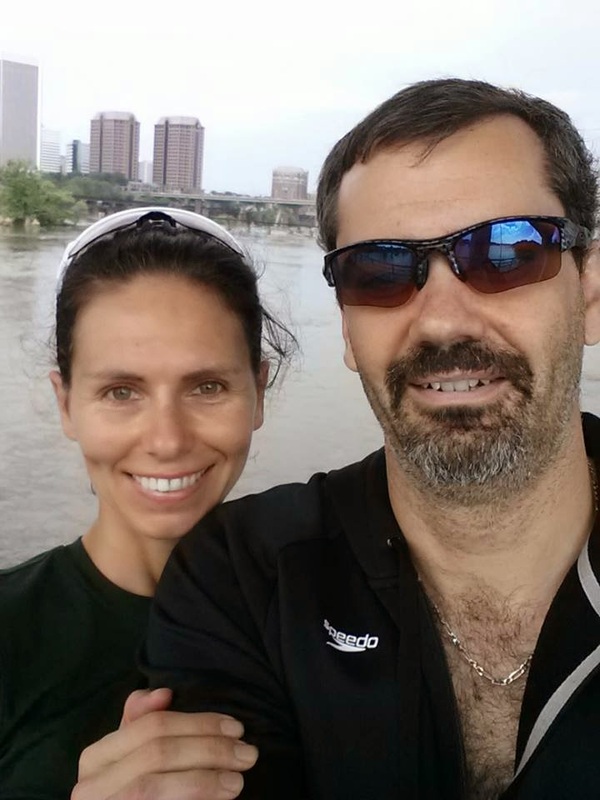 The run started in the center of the city and in a matter of a few minutes we turned toward the bridge. One volunteer looked at me and another racer and said to hurry up since there is a train around the corner waiting for us. I said 'ha that's a good one" thinking he was making a joke. But just seconds later I found myself railroad track hopping and had this monster train standing just a few feet away from me. Oh my, he was not joking at all, there was a train waiting for us. Nice. Seriously in Richmond, whatever you hear and however crazy it sounds, it’s probably the truth. Then we got the long road exposed to the full sun and the tall staircase taking us to the dry wall. This is where I got totally woozy dizzy and when walking it down I hoped I would keep my balance and somehow recover. Now the hot gravel path dipped us under the bridge into the Mayan Ruins, the steep and brutal climb. Those big wooden beams were pointing straight up and I was crawling up like a little baby and when I finally got to the top I just wanted to collapse and call mommy! It was that tough, but the good part is it was not only me that felt that way but most of the racers had the same experience. This is where I had to take a serious look deep inside my soul and see how much will there is still left to deal with all the suffering that was needed to keep on pushing and staying ahead for the remaining miles. The single track did last for a while and was not easy but eventually I was spilled on the open path that leads me to the bottom of the foot bridge. While on the top and starting to run to the other side I looked down and didn't see girls yet but wondered if they were maybe already on the ramp and I just could not see them. Thankfully that was not the case and I kept on pushing through this long and wavy bridge while surrounded by this amazing city scape view and raging river underneath. I flew down the ramp and now last thing to do was to cover the last long road stretch running by the boat ramp where the race started and into the expo zone and into the finish. I had people cheering me on along the way and telling me to keep strong, I felt good now. I didn't allow myself to get emotional however even though I was so amazingly happy that I was able to hold my position. I screamed so loud while crossing the finish line that knowingly or not I made many heads turn. I was just simply happy, so happy; I hugged everyone who was in my way and even got a big hug from “Big Fish”; Christine Jeffrey which was super nice. 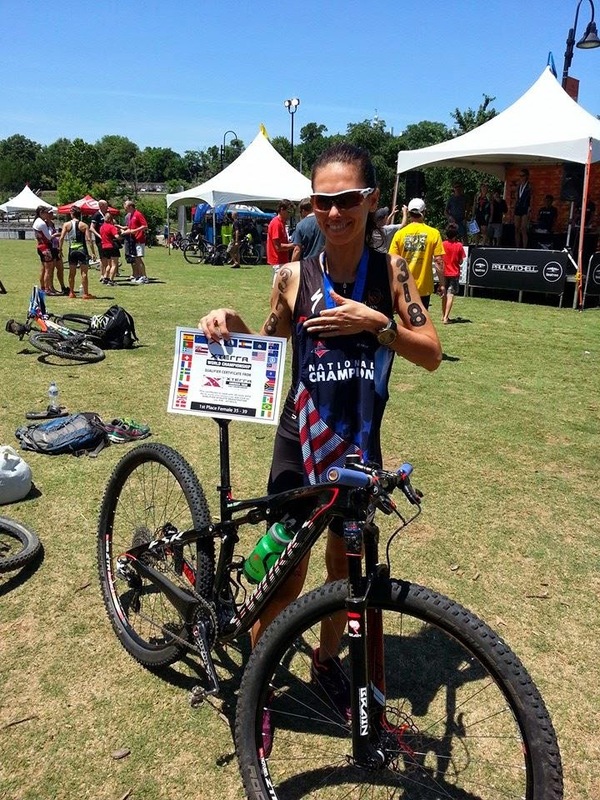 It was an amazing feeling and still I’m trying to pinch myself that long set goal and dream of winning a title of USA Off-Road Triathlon National Champion turned to reality. 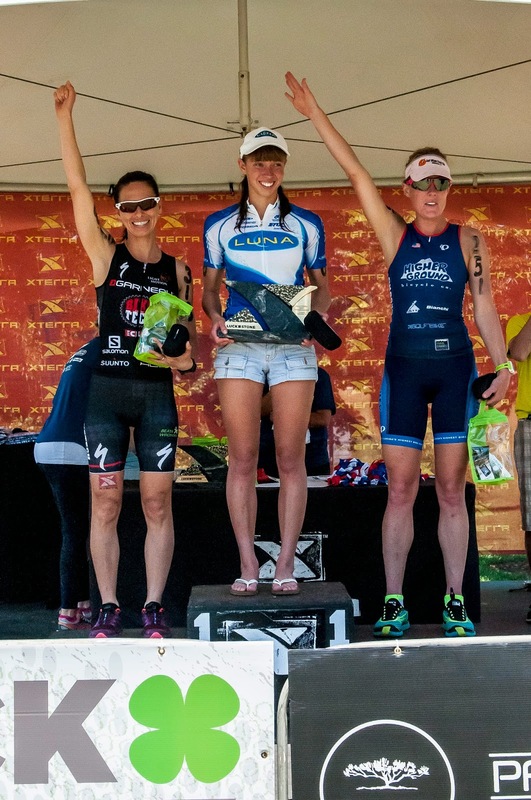 Also minutes later I found out I was actually 2nd overall for all the amateur women with only Hannah Rae Finchamp ahead, who is a 2x XTERRA Amateur Overall World Champion and racer for the Luna Pro Team. This race was also an amazing tribute to Floridian strength with 3 out of top women representing the state. I was very happy to see all of us finish so strong. Brook and Misty were only a few seconds apart and finished a little after I crossed the finish line. Very proud of this Floridian trio placing top 4 Overall; Brook, myself and Misty after the race. I’m happy and grateful for everything that happened along the way that lead me to this moment. I had such an amazing weekend and so many amazing people contributed to this victory. From my husband Pax whose role goes way beyond simply being a husband and a cheering group, and a photographer; after all he took my bike apart three times and cleaned it with Pro Gold in just three days here and drove for two days across the state to bring me to this start line. Also I have to thank his mother Theresa who always takes part of this trip and meets us here and is a big help and we turn this weekend to little family reunion. 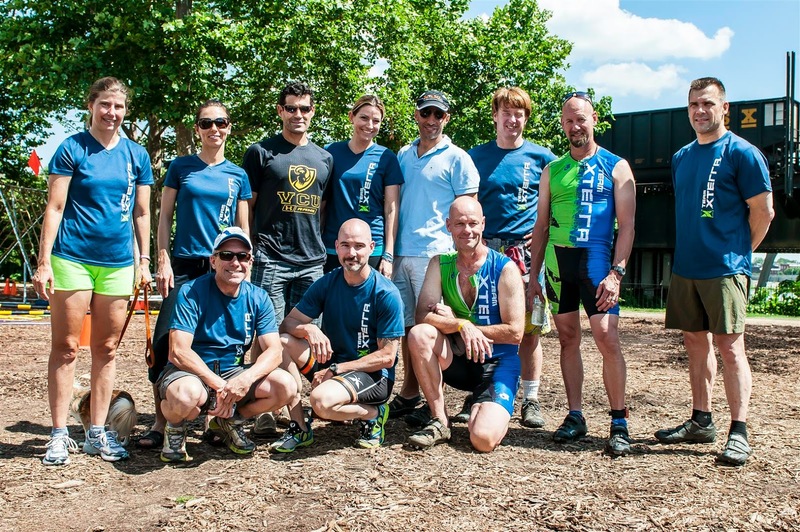 Also big thanks to all my friends starting with Xterra ambassador Marcus Barton, Jonathan Parkinson, Hugh Myrick, and Frank Fernandez Posse for great moments together previewing and analyzing the course. You guys are simply true friends and great company. The time we spend with friends and racers over meals sharing stories and having a great time is simply priceless. Kate and Jim from Swichio, an amazing couple which has lots of love for the sport hosted a beautiful dinner for Pro and not so pro racers and I was very glad I was able to spend the time together with amazing people like Christine Jeffrey, Josiah Middaugh, always hilarious Craig Evans and super cool Karsten Madsen and Branden Rakita. Greyson Keppler who was helping me for the past few weeks prepare for this race was there and a few other fun people. Definitely it was an evening to remember. Also a big Thanks to Jackie and Bobby from Mizner Grande Reality who contributed to our trip. Only people that are missing from my life and I would love to share my joy of racing with are my parents and my sister who live in Poland and I didn't see them for what seems like eternity. I wish with all my heart that one day I will be able to go back and see them and race by their side so they can meet their daughter as a triathlete and no longer a table tennis player. 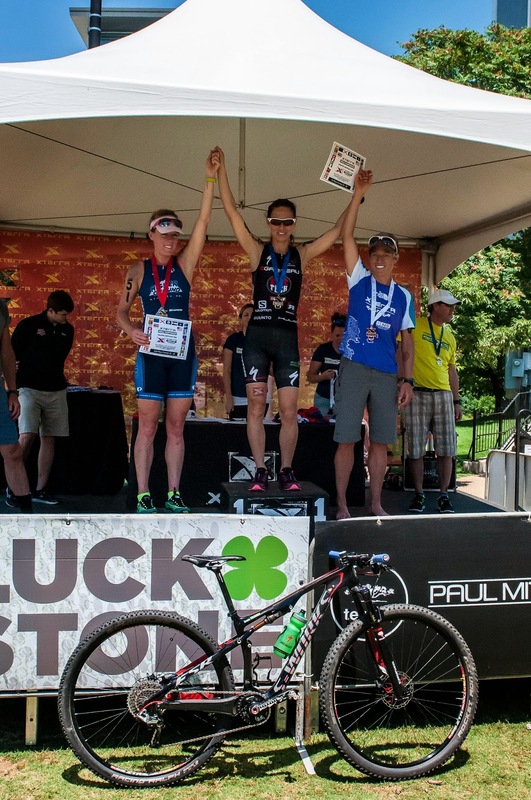 This race not only gave me an Age Group National Champion title but also 2nd overall National Championship title for amateurs and qualified me for the 2015 ITU Cross Triathlon World Championships wherever it may be. Age Group Podium: Brook, Beata, Kristen. Also my amazing bike Sonia made it to the podium! This year ITU Worlds will be hosted in Zitau Germany just hours away from my home town in Poland. I can't describe how much I want to go to this race and see my family! Also I was so happy with everything gear wise that I chose for this race. From my amazing Specialized World Cup Epic bike that took this long two thousand mile journey on the awesome Kuat NV rack, to the tires, bars, grips, to the 32t Q-Ring that I just got from Rotor just in time for this event! 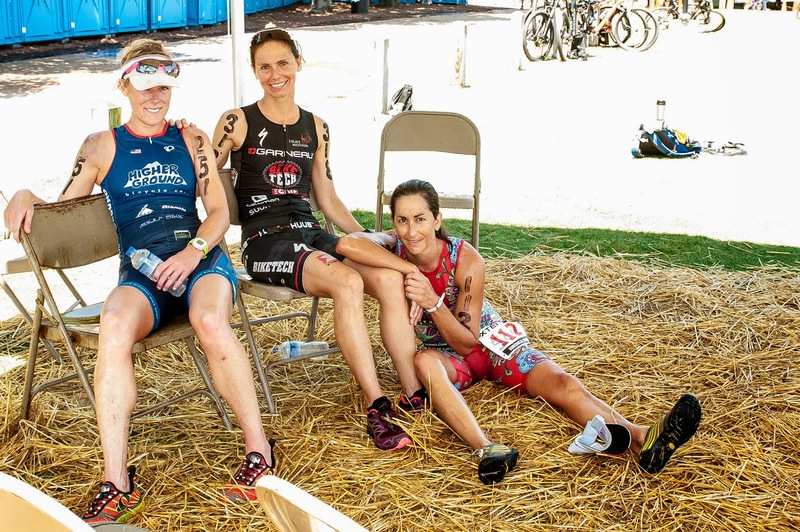 My LG race kit kept me so comfy no matter if I’m in extreme heat or drained with water. My Salomon Pro Sense shoes were incredible and handled this mixed city and off road and even water crossing terrain brilliantly and my feet stayed fresh. The awesome Huub skin suit got finally its first race in and was a joy to wear. Suunto Ambit 2S watch recorded all the action and all the pain in numbers. My new Oakley glasses stayed put and clear with the VR 28 lenses which worked out well on those mixed trails. Also I was testing a new cool GPS tracking device from Pocketfinder for my husband’s sake. After all I was laying down the trail last year after my crash and my husband didn’t know what happened and first time he saw me after my race was in the ER without knowledge on what happened. 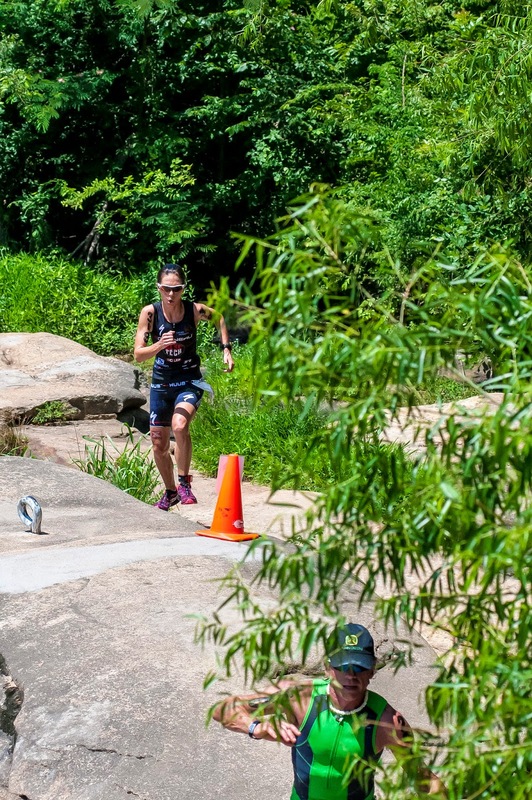 I wanted to Thank Grayson Keppler for helping me out with preparation for this event for the past few weeks and contributing to my USAT Off-Road National Championship title. When you are getting ready for an important race or simply want to become a faster athlete you can achieve it by working with Grayson. I'm always thankful to all my sponsors for the support and trust in me and in my dedication to chasing the dreams. I'm forever grateful. Bike Tech Miami, Syntace, Magura, Stan’s Notubes, Schwalbe, ESI Grips, Clif, Xpedo, Trainer Road, Garden of Life, Pro Gold Lubricants, Kuat Racks, Light & Motion, KT tape and New for 2014 - Specialized, Salomon, Suunto, Louis Garneau, Selle Italia, KMC Chains, Oakley, Huub, PocketFinder and Rotor Bike Components!